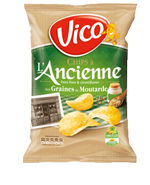 Vico was formed in 1955, as a cooperative in the Picardie region of France. It specialised in Potato Chips, dehydrated mashed potato and other potato related products. In 1998 it was taken over by Intersnack. Intersnack France is the leading French manufacturer of salty snacks market. It was formed from a merger between Lorenz Bahlsen and Vico. It has more than 600 employees and is the largest non-German subsidiary of Intersnack. In 2011, the Vico brand became the umbrella company for all of Intersnack’s products in France. The former Vico slogan ‘King of the Potato’ with its little cartoon potato character wearing his hat made from French Fries was replaced by the slogan ‘King of the Appetizer’ and the little guy’s hat became a Stetson. The little King Potato has been around since the mid-60’s so he was probably due for a hat change! The Intersnack group's products are sold in over 70 countries worldwide. Sales in France exceed €250 annually.